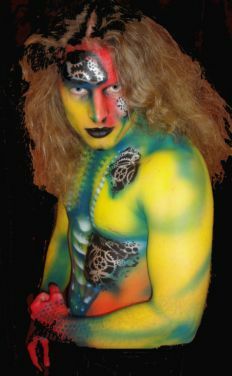 Wendie has been a professional body painter for 12 years. She has worked extensively all over the North West for private and corporate clients as well as Film, Stage and TV work. She is a multi-award winning artist and has worked for many of the North West’s leading companies. She possesses highly skilled brush techniques and can paint both logo’s and brands to an exceptional standard. She has worked on numerous large projects with several models leading and instructing the team, and working to close deadlines. She is also an accomplished Balloon Modeller and Temporary Air Brush Tattooist. 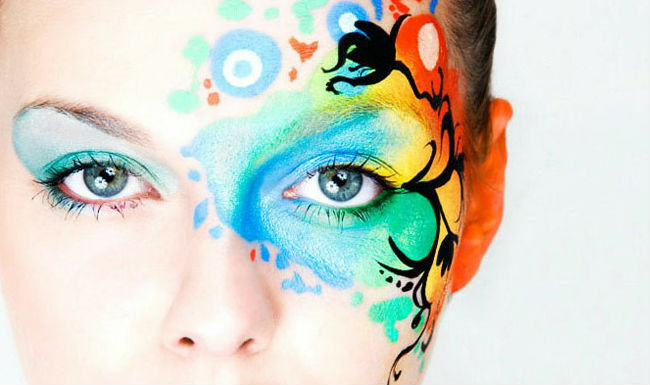 She can twist over 100 different designs to suit all occasions and carries a large selection of Temporary Tattoo’s to please both children and adults alike. Just an email to say thank you for your fantastic face painting, We had a fab time and the “Kiss” makeup was puuuurrr-fect (I was the Catman !! ). I have already recommended you to all our friends, who also like to dress up as 80’s rock bands on “Crazy nights” out, so prepare for an avalanche of calls ! I just wanted to say what a fantastic job you did and everyone was so impressed and complimentary, I’m still getting compliments by phone today to say how fabulous you were. I will definitely be booking you again in the future. Your face painting was fabulous. Thank You so much.